Mr. Pradeep is Assistant Professor in the Finance Department. 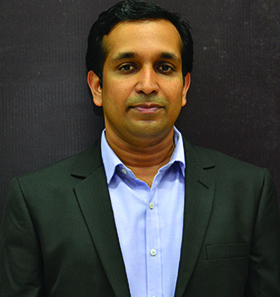 He took his MBA from the Faculty of Commerce and Management Studies, Calicut University and is also NET qualified. He worked for seven years as a Consultant with Cape Gemini India Pvt Ltd, Bangalore before joining Christ University and subsequently in M S Ramaiah University of Applied Sciences, Bangalore, as Assistant Professor. Joined SCMS Cochin School of Business in May, 2016 as an Assistant Professor in Department of Finance. Worked in Capgemini India Pvt. Ltd. (Bangalore) from June 2007 to June 2014 in various roles like BU Controller, Consultant-AP etc. Faculty coordinator for Finance forum.